Cost - $2,490.00 per vehicle with up to four passengers. This trip does about two hundred kilometers of the normal west/east Simpson Desert crossing anyway, so you will be able to tick that box as well, plus the other part of our trip is north south through the remote North Simpson Desert as well as to, and through, several outback towns and places along the way as we travel through four states. The north south route through the North Simpson desert is extremely picturesque as we folow the old Hay River, with ever changing vegetation and scenery and, the best part, there are less tourists and their vehicles, in fact we may not see another vehicle for some days unlike the normal crossing that can become very busy vehicle wise. Your tour leader, John Cantrell, is one of NSW leading, nationally accredited, 4wd driver trainers with decades of 4wd driving experience in both Australia and overseas, some of which has been in very remote areas, and will be happy to help you along the way if needed, he has led many trips through this region in the past, in fact more than most, knows the area very well and what to expect along the way. This is an amazing trip and it is your chance to experience one of Australia's lesser known and travelled regions, the Hay River and the North Simpson Desert, which is a relatively new 4wd destination. Interestingly enough it is possible to do the run through parts of the Simpson and the North Simpson Deserts following the Hay River without climbing many sand dunes at all, and those that you do climb are fairly easy by traveling from the south to the north. Most seem to do it this way, running from the south up to Batton Hill Camp, but we believe you are not doing yourself justice in doing so, you will miss out on so much of the desert experience. The dunes are a very big part of the fun in doing a desert crossing and the Simpson and North Simpson Deserts can never be complete without their dunes. Relatively few have traveled this route in the past and most will never have the opportunity to see this part of Australia in it's current and pristine state. Along the way our route takes us through several iconic outback towns in South Australia, the Northern Territory, Queensland and New South Wales and through various deserts including the North Simpson, Simpson, Sturt, Strzelecki and along the outskirts of the Painted Desert. 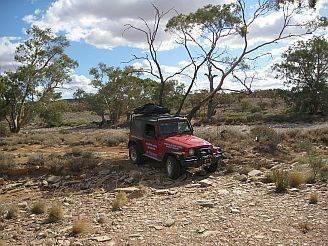 This 12 day trip takes us to one of the more remote and lesser travelled destinations in Australia, in some places there may not even be a visable track if there has been a heavy wind. 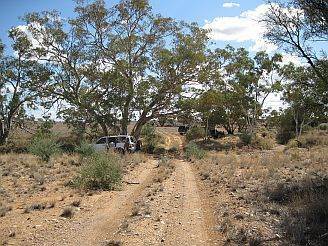 The trip starts at Marree in Outback South Australia and ends up at White Cliffs in Outback New South Wales. Our travels will include visits to iconic towns and places including Oodnadatta, Dalhousie, Mt Dare, Old Andado, Alice Springs, Batton Hill, Birdsville, Tibooburra, Innamincka, Milparinka and Cameron Corner. Other attractions include Lake Eyre South, Cooper Creek, Burke and Wills Grave, The Dig Tree, Eyre Creek, Big Red and more. We may even get to see the outstanding Coongie Lakes. On leaving Alice Springs on our final leg before our desert crossing we head north along the Stuart Highway before possibly changing course towards the western end of the East McDonnell Ranges. 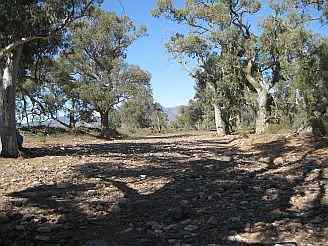 It is a personal opinion but some rate the East McDonnell Ranges as better than its western counterpart, the West McDonnell Ranges, a little less known and visited perhaps, dirt tracks instead of tar roads so a little more rugged maybe, more remote, less commercialised and lots more, I tend to agree. The North Simson Desert and Hay River part of our adventure starts when we turn off the Plenty Highway, north east of Alice Springs, and travel towards the Batton Hill Camp. We will set up camp for the night either at Jervois Station or at Batton Hill and within the Batton Hill Camp and we may be able to take an early evening drive out to the Goyder Pillar to see the spectacular sunset views that it offers, depending on what time we arrive. Next morning we are up and off on our journey south through the North Simpson Desert whilst we follow the now extinct Hay River. For the next few days we probably won't see too many other vehicles or people, in fact it is not unusual to go the whole way down to the junction with the QAA Line on the edge of Lake Poeppel without seeing any. Our route will take us down through the paralell dunes where, in some places, the tracks may become barely visible if there has been a high level of wind activity. Between the Batton Hill Camp and Poeppels corner we pass through some interesting landmarks including the Tropic of Capricorn, identified only by GPS and a hand written, weather beaten, sign, a must do photo opportunity for most. We will experience some of the country explored by Cecil Madigan, a geologist first and explorer second, who crossed the Simpson Desert from Andado in the west to Birdsville in the east using camels for transport in 1939 during the first major expedition across the Simpson Desert. Whilst Madigan's route took him mostly from west to east he did travel south for a short while between his Camps 15 and 16. Camp 16 is by far the more interesting of the two and where we will almost certainly take a short break. The Hay River Track comes to an end when we start heading west and onto Shotline for a while. We will probably camp down this way, either just before Shotline or else further south towards the abandonded Beachcomber Oil Well. We are now on the K1 Line and a relatively short drive to the junction with the QAA Line which is one of the major, and much more populated with vehicles, west, east tracks across the Simpson and which will be our route for the next 200 km to Birdsville. But first we will go a little further south and following the shores of Lake Poeppel, not that it is likely to have water in it, so that we can visit the iconic Poeppel Corner. It is here that South Australia, Queensland and the Northern Territoy join that travellers seem to magnetically be attracted to. 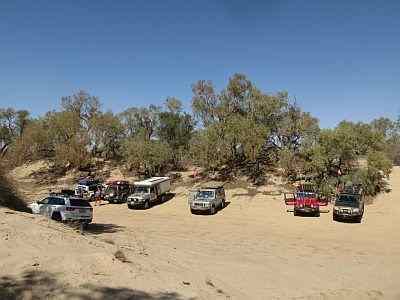 So one more night camping in the desert before going through Eyre Creek and then attempting the final challenge of the Simpson Desert, Big Red sand dune. Big Red is famous for being the highest and hardest sand dune in the Simpson Desert being approximately 60 metres high. It is also the most easterley before Birdsville. Like Poeppel Corner, Big Red seems to magnetically attract 4wd adventurers, even if they haven't been across the desert. I guess for many it is so that they can claim bragging rights to having conquered this iconic legend. Track conditions in this part of the world can change very quickly, particularly with adverse weather changes and rain, so our route from Birdsville to White Cliffs will be determined by what the weather has been doing. Exiting Birdsville via the Old, or Inside, Birdsville Track and heading for Walkers Crossing will be our preferred route, if passable. We plan to spend the next night or two at Innamincka, where you will have a day free to visit whichever or the many attractions are in the area including the Cooper Creek, The Dig Tree, Burke and Wills graves, Coongie Lakes and more. Cameron Corner, the meeting point of New South Wales, South Australia and Queensland, is our next destination. We will spend our last night camping around here but maybe not at the store itself. 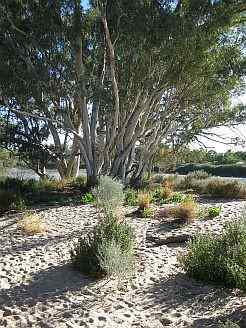 Next day visits to Tibooburra, Milparinka and, our final destination, White Cliffs. If you would like to do this trip please book early, there is a limit to the number of vehicles we can take on each trip and once fully booked we cannot add any more and, because this trip offers such good value, it does book up fairly quickly. This is a self catered camping trip on which camper trailers and caravans will not be accepted. The trip will be led by the owner of this business who has an interest in you getting the very best value out of your trip. Perhaps you should have a read of our testimonials page to see what many have said about this trip, it is a great trip and you won't be dissappointed. 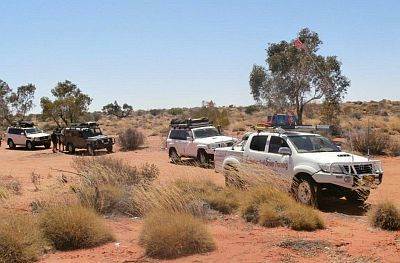 Australian 4x4 Travel will supply a support vehicle fully equipped with recovery equipment, long range communications, GPS tracking equipment and Emergency Locator Beacon.